Structure My Deal tools are complete — you're ready to visit New Way Ford! The Ford Fusion is a popular midsize sedan at New Way Ford. Many consumers choose this model because it comes well-equipped with a number of technology features that offer exceptional entertainment. Let's look at a few technology features offered with the Ford Fusion. The Fusion offers the available SYNC 3 infotainment system. This infotainment system comes with Apple CarPlay and Android Auto. Apple CarPlay lets you connect to Siri, Apple Music, and Apple Maps. With Android Auto, you can access Google Now, Google Maps, and Google Music. Android Auto and Apple CarPlay both allow drivers to make hands-free calls. You also get a trial to SiriusXM Satellite Radio, SiriusXM Traffic, and Travel Link. SiriusXM Satellite Radio offers more than 150 channels of entertainment, news, and music. 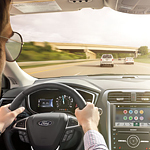 The Fusion is equipped with FordPass Connect, which is an in-vehicle Wi-Fi hotspot that is powered by AT&T. This hotspot can power up to 10 devices and is accessible from up to 50 feet outside of the sedan. Although every reasonable effort has been made to ensure the accuracy of the information contained on this site, absolute accuracy cannot be guaranteed. This site, and all information and materials appearing on it, are presented to the user "as is" without warranty of any kind, either express or implied. All vehicles are subject to prior sale. Price does not include applicable tax, title, license, processing and/or documentation fees, and destination charges. ‡Vehicles shown at different locations are not currently in our inventory (Not in Stock) but can be made available to you at our location within a reasonable date from the time of your request, not to exceed one week. Credit/Debit Card services are provided by New Way Ford for a Convenience Fee of 2% for any amount being paid over $500.00.